Ladies and gentlemen, I have just completed my first homemade gnocchi. Gnocchi, which are usually listed with the pastas on an Italian menu, have a dissimilar preparation to pasta and different ingredients. There are many varieties of gnocchi—spinach, semolina, ricotta, yam—but the standard is gnocchi di patate (potato gnocchi). 3) Because one time about two years ago I went to try and get a waitressing job at my favorite Italian restaurant (I Coppi), and the smackdown was laid upon me by the manager/owner/chef, who assailed me with a quiz about homemade Italian food. She seemed exasperated, but at the end of the interview she told me to come back on Thursday. I was so traumatized by the interview (I had just stopped by to pick up an application, after all) that I (embarrassingly) didn’t make it back. But next time, I’ll be prepared. It was pretty hard, but not as hard as expected, ultimately. The hard part would have been making the gnocchi look pretty (a step that I didn’t bother with, as it happened). They turned out deliciously, however! Boil potatoes until cooked; drain. Mash thoroughly or pas through potato ricer for smoothness. Transfer to bowl. Allow to cool. Add the egg and mix thoroughly; add the flour and do the same, kneading as it becomes necessary. Always flour hands before kneading. Note: the more you knead, the more flour the recipe will require, and the more leaden the gnocchi will be. 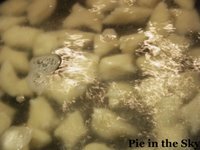 Mix until you have a pliable ball of dough that is lighter than regular pasta dough but doesn’t stick to your floured hands. Prepare a work area and dust it with flour. Shape dough into lemon-sized balls and roll them out with your hands until you have rolls about 3/4 inch in diameter. Cut the tubes of dough into pieces about one inch long (this is the part where it gets unpretty). Using a deep pan or pot with a lot of bottom-surface-area (I ended up using a wok), bring about 3 inches of water to a simmer. In batches, carefully place gnocchi in the pan; try not to let them touch each other, or they’ll stick. Let boil about 3 minutes or until gnocchi float up; remove immediately to slotted spoon. If you have to do several batches and can’t serve the gnocchi right away, coat the finished gnocchi in a little olive oil to keep from sticking together/drying out. 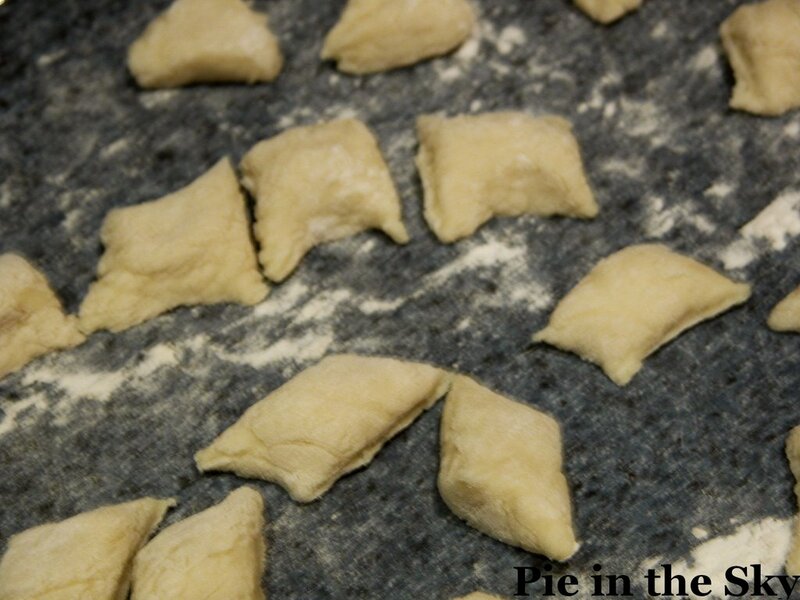 Once gnocchi are finished, melt better in large pan; cook over medium-low heat until browned but not smoking. Add sage and infuse 1 minute. Pour over cooked gnocchi; season with salt, pepper, and cheeses (be warned: too much cheese makes this dish taste dry). In spite of messiness and lumpiness, this was super fun and I feel like a real Italian chef now. I’ll show you, I Coppi! Just wait! wowee kate, those are goregous! my gnocchi usually turn out ultra tasty, but utterly ugly! you must have the patience of a saint! Hey, mom and I just made gnocchi last night. Only we didn't make it from scratch. How do you keep it from getting goopy and slimey? Bravo, Kate! This is very similar to the first gnocchi I ever made after drooling over an episode of Giada's Everyday Italian when I had my tonsils out (I was SO bored and STARVING for food that I could eat but didn't have to be slurped through a straw!). And I think it look very pretty! kate, that is some mighty fine looking gnocchi. oh my god kate, that looks so good ! i am so impressed you made your own gnocchi. i am much too much of a wimp to attempt this, but thanks for the inspiration :) i think i might have to try this very soon. Is it spring in nyc already? How I miss that place! Wow, Kate. These do look gorgeous--I'm so impressed!